Hi guys! This is a super exciting, kinda' scary, majorly stressful time in our family -- our oldest child is graduating from high school! Let me say that again -- mostly just to let it sink in so maybe I'll start believing it -- my first baby is GRADUATING from High School and going off to COLLEGE! I mean, on the one hand, yikes because she's moving out of state and all that. But on the other hand, YAY! So much, YAY!!! We are so proud of her accomplishments and the amazing young woman she has become. I mean, look at her, will ya?! 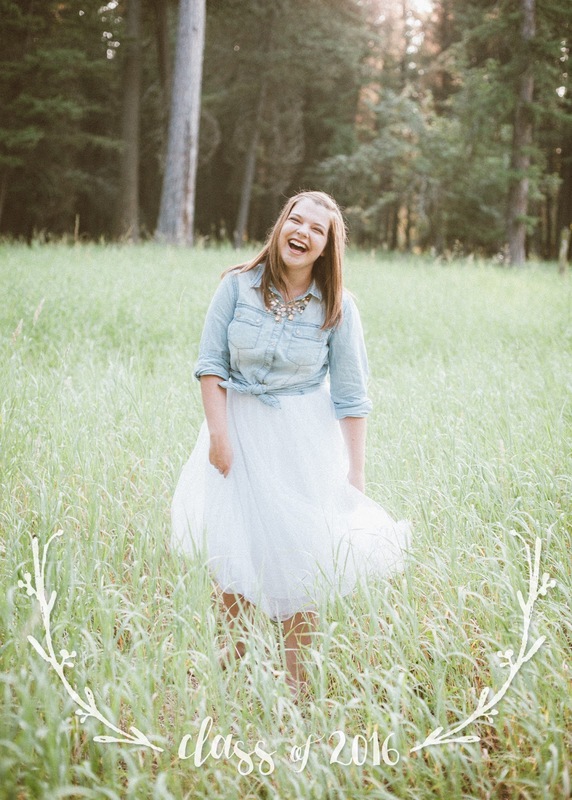 We are in love with Syd's amazing senior portraits from Rhane Drop Photography. A graduation, whether it be high school or college, begs to be celebrated in a pretty big way. With that in mind, I designed a few fancy cut paper cake toppers. Pop one on the top of any old cake and you've got yourself a celebration. No one needs to know how easy they are to make! All you'll need is some stiff card stock, bamboo skewers, and a Silhouette cutter. My Silhouette Cameo is my absolute favorite crafting tool and the best investment I have made in years. My husband bought it for me for Christmas a year and a half ago and I use it at least weekly. 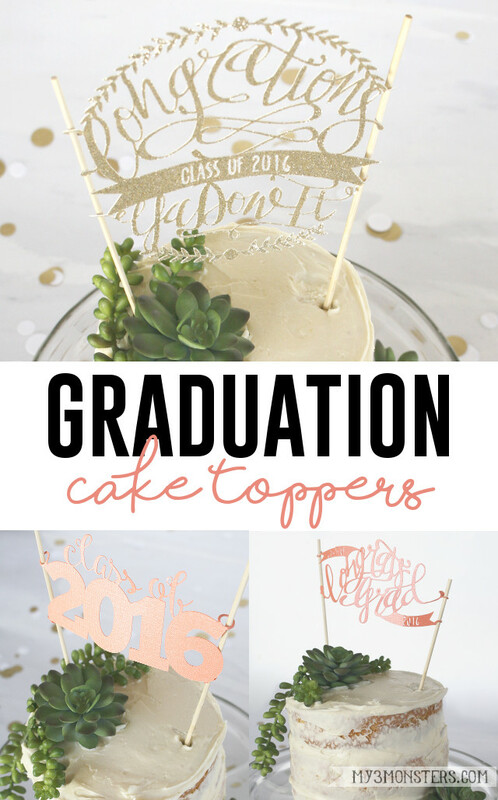 To make these cute cake toppers, simply download the cut files from the links below, open them in the Silhouette Studio program, and cut out of card stock. Place bamboo skewers through the loops on either side and insert into the top of your cake. Easy cheesy! I love the simple, bold look of this one. Download the Class of 2016 cut file here. This one is a little more ornate, but not too off the wall. It's a hand lettered design that I drew and turned into a digital design. It's hard to see in the photos, but the ribbons say Class of 2016. Download the Congrats Grad cut file here. OK, so this one, which happens to be my personal favorite, needs a little explaining. This is a silly saying our family has used for years. Yes, we know it is not grammatically correct -- never mind the fact that Congrations isn't even a real word. The irony of saying "Congrations, ya' done it" to celebrate someone's educational accomplishments gets me every time. This is another hand lettered design created by yours truly. I gave you a sneak preview of this one in progress on Instagram a while back. I LOVE how it turned out. Download the Congrations Ya Done It cut file here. I guess we're just going to have three cakes after graduation this year because we can't choose just one topper to use. Now that's a celebration!! Are you celebrating anything fun this spring? Leave a comment and share your good news! I feel exactly the way you do with your senior graduating! My quadruplets graduate June 15th. I get tears just thinking of this! Two are moving to Canada to go to university. One is heading across the state to university. The last one is hopefully entering the military. I am going to be a mess!!! !